Today was another beautiful day in the desert southwest, and a great day for a hike. After breakfast we drove over to the trail staging area and joined the "Hiking 101 for Anyone and Everyone" hike at 10am. This is just one of the many activities offered here at Usery Mt. Regional Park. Park hosts Bob and Madge led the hike. Originally from Minnesota, they have been hosts here for 5 years. 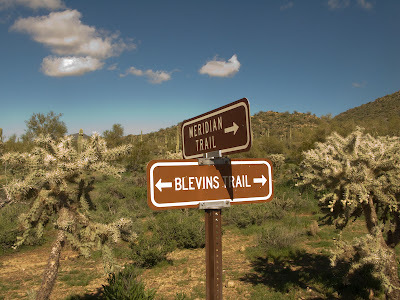 We were joined by 3 other couples and with walking sticks and water bottle in tow we headed for the Blevins trail, a 2.9 mile loop. 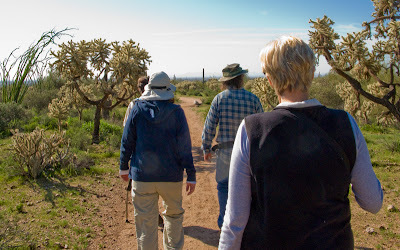 Bob and Madge were good guides as we made our way along the trail, pointing out various cacti and flowers and were willing to answer any questions. Surprisingly, we walked at a very brisk pace and even worked up a sweat and by 11:30 we came to the trails end. Great hike! 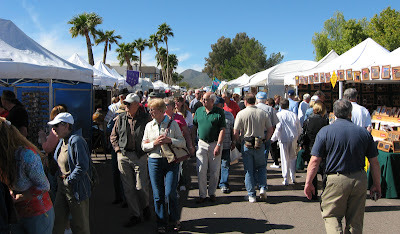 While eating breakfast this morning we had the tv on to a local station and someone mentioned that the 'Great Fair' arts and crafts show was going on this weekend in nearby Fountain Hills. So after our hike, we drove back to the rv for a quick lunch of turkey wraps and then drove over to Fountain Hills to check out the fair. What a huge fair and huge crowd. 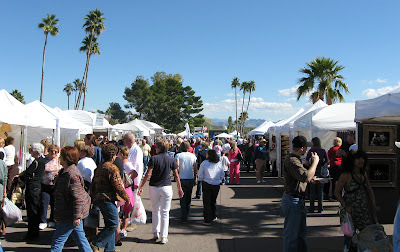 After finally finding a parking space we began wandering past the many booths. Our two purchases were for Judy. She found a hat that will be great for blocking the sun while hiking. It's made by the Oregon based company SUN DAY AFTERNOONS and has 50 UPF coverage. She also found a small unique leather purse crafted and designed by leather artisans Tom and Shawn Thomas from Texas. The long strap will be great for hands-free shopping and traveling. After walking around the fair for over an hour we still hadn't seen everything, but we were ready to leave. We were ready for dinner,and specifically, Mexican food! John had seen an ad for Rancho de Tia Rosa that sounded good so we thought we would give it a try. It turned out to be a great choice. John had chicken Mole Poblano and Judy had grilled Mahi Mahi with mango salsa. Both were very delicious. John thinks this was the best Mole he has had. The restaurant has been voted best Mexican restaurant 3 years in a row.